“I am writing to both thank and highly recommend Valli Opticians. My wife Janine had a routine eye test and it was picked up on that she had a macular defect in her retina. She was immediately referref to a specialist and the problem is now completely resolved. “I visited Valli Opticians in Honley on the off-chance that somebody would be able to make my glasses fit. Time was taken to carefully check them out even though I was not a customer. Adjustments were made and they now stay put and are much more comfortable. The strange visual effects have disappeared and I feel much more confident wearing them for driving. I decided to order a new pair of glasses and I am looking forward to their arrival. “I would like to take this opportunity to thank you and all the staff at Valli Opticians, Meltham for the professional, honest and thorough service I received from the point of contacting you to arrange to have my eyes tested, through to helping me chooses the right lenses for me. I would highly recommend Valli Opticians to anyone who has been struggling with headaches and squinting at road signs. I’m not quite sure why I’ve left it so long? “I would like to take this opportunity to thank you for your extremely prompt service during my recent eye emergency. As you know last year I had to have major eye surgery under general anaesthetic for what was a virtually detached retina. This was because in my innocence I didn’t recognise the early symptoms, which at the start seemed quite trivial. I was informed by the Consultant who performed the operation that the same condition, would over the next couple of years, occur in my other eye, worryingly the warning signs started whilst holidaying abroad. Rather than try to get an appointment with our GP and then be referred, my husband was able to alert you at Valli opticians and you arranged an urgent examination on my return. Thankfully your optometrist Russell Ramsden was able to confirm the very early onset of my eye condition and because of his seniority he was able to refer me directly to the eye hospital at Calderdale Royal Infirmary. Two days later I had minor laser treatment which cured the problem without even needing anaesthetic. Hopefully I shall not now need further treatment. So thank you again for being my 4th emergency service I shall continue to sing your praises and that of Valli opticians to anyone that will listen. 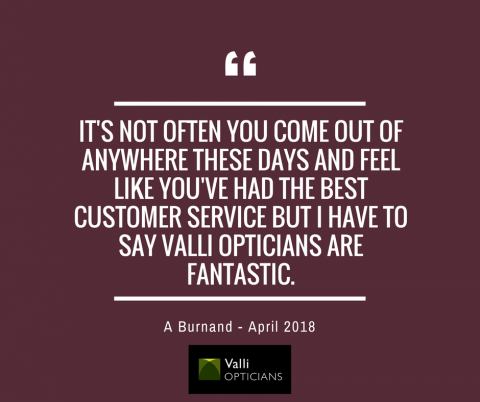 “I would like to thank Valli Opticians for the high quality service they have provided for me, from the professional consultation to the glasses themselves. I will have no hesitation in recommending Valli Opticians to all my family, friends and work contacts. “I am writing to thank and applaud the hard work of your caring team at Valli Opticians. Whilst I had reservations about trying contact lenses for the first time, I felt confident that my hand was being held by well trained experts, who could help me every step of the way. I would definitely recommend the personable and high quality service to friends and colleagues. “Thank you for the brilliant service from you and your staff at Valli Opticians. After 25 years of not wearing glasses, to wearing glass much of the time, I found the transition easy and worry free thanks to your staff and their impeccable customer service. Thank you once again for offering such a fantastic customer experience. Valli Opticians is a service I would recommend to my family and friends without hesitation. “A big thank you to everyone at the Mytholmroyd branch of Valli Opticians. It suddenly dawned on me a few weeks ago that I was getting old when I had to ask Jackie to read the small print on some instructions. It wasn’t so much the shock of not being able to see the print. But the fact that I’d actually thought about reading the instructions in the first place that made me realise something was wrong. The experience at Valli Opticians was great from the moment I walked through the door and was asked if I’d like a drink, to the friendly and informative service with regards to my eye test, and then when choosing glasses. Thank you to all the staff, I’d have no hesitation in recommending Valli Opticians to anyone and everyone in the future. “I would like to express our sincere thanks for your diligent care and professionalism afforded to our son Alex. Until we came to Valli Opticians Alex struggled along with “normal” glasses. Now thanks to the prisms and special coloured lenses he finds reading much easier and has fewer headaches caused by eye strain. Valli Opticians are so good with their care of patients that Alex was keen to come in and update his prescription in time for his exams. Without the very welcoming and caring attitude Alex might have found it all a bit daunting, as it can be difficult to cope with eyesight that is deteriorating when you are still in your teens. Both Tony and I will of course continue to recommend Valli Opticians to all our friends, family and contacts. “I am writing to show my appreciation for the service I received at the Almondbury branch of Valli Opticians. The staff were great when I spoke to them to arrange the appointment and confirming that they were still open, even in the snow! I saw Oliver during my visit and he answered all questions I had and talked through what was going to happen during the contact lens check I was having. I’d have no hesitation in recommending Valli Opticians to both personal and business contacts. “After realising my eye sight wasn’t quite up to scratch your test suggested I required optical assistance. I was initially unsure and ignored the issue for a few months. After speaking with you, you explained the options available to me. I felt reassured and acquired the confidence to take action. On a visit to the new Lockwood office to tried out some spectacles. The help and advice you offered was superb, and the service was exceptional. You and the staff there overcame my initial fears and found me some “glorious goggles” which I now wear with pride. Also the difference in my sight is quite remarkable. “I just wanted to pass on my thanks for the Savile Row glasses which I picked up this morning. They are quite simply a marvel in every way; light, elegant, and look really good on (to my eyes anyway). Thanks for all the effort on this, it is greatly appreciated and I think we ended up with something quite exceptional. “I thank all the staff at Hebden Bridge – Valli this morning, it was great to meet caring people, and people who are so very friendly to deal with. “I would like to thank you for looking after my eye care needs. I had an eye test within the last 3 months at my local optician, but started suffering from headaches and slightly blurred vision. Your company was recommended to me and I could tell straight away from the moment I stepped through the door that you were one step ahead of most opticians. I was made to feel welcome by your friendly staff and the service, professionalism and knowledge was second to none. When you completed a thorough eye examination, you informed me that I had been given the wrong prescription by the previous opticians, which explained the headaches and blurred vision. I would not hesitate to recommend your service to any of my friends, family or colleagues. “All musicians need to be able see their music, see the conductor and see their colleagues in the band. As we get older and our eyesight changes, this becomes more difficult. When musicians go to an optician, it is rare to find one that understands these issues. Indeed most opticians tend to stick to the standard ways of viewing optical problems. Valli Opticians have an Optometrist who is himself a Trumpet player, so he understands the frustrations and difficulties musicians may be experiencing. It isn’t always easy to admit you have a problem, as your colleagues can often not understand these difficulties, having not experienced them themselves. As a Conductor and former professional Trombonist myself, I have suffered from these issues. Having been short sighted for many years I recently had cataracts removed, I was becoming really quite concerned. I have also had a detached retina re-attached and have appreciated the help and guidance from the professional team at Valli. If you suffer from not being able to see the music/conductor, or any of these frustrating issues, get in touch with Valli Opticians today. I cannot recommend them enough. “Just a quick note to thank you for the very pleasant experience I have just been through having my eyes tested. In the past I’ve always been to Boots Opticians however I now realise the difference between a high street national brand and the local Valli opticians branch in Honley.. and its all about service. Two really smiley ladies greeted me as I walked through the door, offered me a coffee then personally talked me through a couple of forms that needed completing as a new customer, then took me for the eye test…”on time” … no delays or long waits here! The optician was extremely professional even when telling me that the reason I needed varifocals was due to “an age thing” and he put me through a few tests that I’d not done before – you’ve obviously got all the very latest technology. The whole experience was much more pleasant than I’ve been used to before, and extremely convenient being local. I won’t hesitate to tell my friends and family and will recommend Valli Optcians at every opportunity. “Very professional staff, a genuine company and great choice of excellent products. “I am writing to express my thanks for your exceptional service and professionalism. As you are aware I went through a difficult period last year having had some problems with my eyes, after numerous visits to the eye specialist at the HRI, I was given the all clear (Pardon the pun). I [attended] your Almondbury practice, where I was greeted in a very professional manner, and underwent an extremely thorough examination by a very polite Optometrist. Within a week I was fitted with my new ‘glasses’ by a very helpful and professional assistant at the Almondbury practice, and have found life in the ‘reading lane’ a lot more comfortable. The quality of service I received leaves me with no hesitation in recommending Moin and the Valli Group of Opticians to all my family, friends and colleagues. 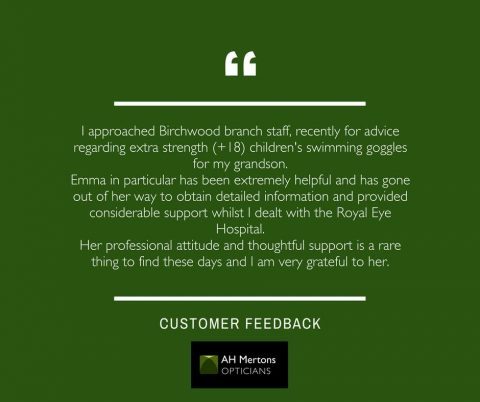 “From the moment I walked in to your opticians it was obvious that customer service is top priority which is a massive change to all the big brand high street establishments. I’d not had an eye test for a few years so I booked in with you and I have never had such a professional eye examination. All the little measurements and test were explained and made me feel relaxed and at ease. I left feeling very well looked after and a lot more aware of what my eyesight was like and how to look after them better which made me realise how little I knew about my eyesight despite wearing glasses for 20 years. I’m glad I gave my business to such a deserving local business. I would not hesitate to recommend Valli Opticians to any of my friends and family. “A short note to thank you for youe help recently. I had noticed an increasing problem with flashes in my right eye that were giving me cause for concern. After having mentioned this to you within an hour you were in touch offering me an appointment that lunchtime, which was great being able to squeeze me in between clients. You explained what was likely to be wrong and the various solutions. To my relief it was only a minor problem and nothing to get overly concerned about. The speed, clarity and calming effect of your service is second to none and I wouldn’t hesitate to recommend you and Valli Opticians to anyone. “Rarely do I come across such exceptional customer service than that or Valli Opticians! Towards the back end of last year I had my eyes checked by Kamal at the Meltham practice. Kamal was brilliant in explaining all that was happening & put me at ease straight away. I hate having the pressure test on my eyes but again Kamal talked me through it, no problem. I then went on to choose two pairs of glasses. One for home, computer use & one for out & about. I decided on the same frame but in different colours….. I called back a couple of weeks later to have the new glasses checked by Racheal & Heather. What fabulous service. Highly professional team & great to find an organisation that puts the customer at the heart of everything they do. Thanks again for the excellent service & I would have no hesitation in using your services in the future or in recommending you to my friends and contacts. “I would like to thank you for the caring service that I received from you and your staff at Valli opticians. The personal, friendly and professional service from all the staff are what make the ‘Valli experience’ a great one. This is complimented by the modern, smart and impressive optician environment. As soon as I walk into the practice staff greet me by my first name and as though they know exactly who I am and that they are expecting me. They also call me the day before all my appointments to confirm the date and time. I genuinely believe that you care about my eye health. You ask to see me every three months and provide a thorough examination, tailored to MY eyes. I feel Valli are always looking for ways to help their client’s and that the 3D eye scan machine is an invaluable service. I have no hesitation in recommending your high standard of service. “I would like to thank you for your professional service you have given me over the last few months. The service, knowledge and expertise have been of the highest standard from both you and your employees, also the care and time taken throughout the whole process is a refreshing change from the high street chains. I would not hesitate to recommend your company to any of my friends and associates. “After starting to suffer from dry and tired eyes at work and not receiving my contact lenses on time from Specsavers, I decided Moin was the man to go to. I had my eyes tested only 10 days bbefore seeing Moin but when testing again he immediately noticed there was a mistake with my lefts eye’s prescription. To try and help avoid the uncomfortable feeling of wearing dry contact lenses at the end of the day I’ll be using 2 weekly contact lenses as opposed to monthly. Thank you for caring Moin. At Valli Opticians I’m more than just a number. I’m a patient who is cared for. “My husband and I would like to extend our sincere gratitude to you for helping our son overcome some of his eyesight and Dyslexia problems. We thought that as we were already seeing a good reputable local optician that we’d covered any problems with eyesight linked to his Dyslexia and the chronic tension headaches from which he suffers. What a good thing that we came to you for your specialist expertise in Dyslexia and visual stress. Since seeing you Alex has booked a hospital appointment to confirm his diagnosis of Keratoconus but since getting his new glasses he has suffered less with headaches and has reduced his medication. We can’t thank you enough – Alex is now at sixth form college and help with his eyesight and headaches will make a big difference to his studies. 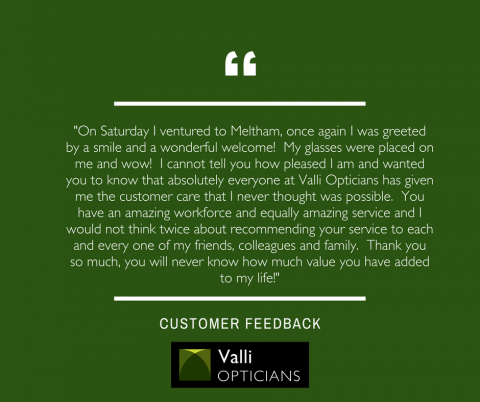 “I am very pleased to recommend the excellent service provided by Moin Valli and his staff at Valli Opticians at Meltham. From the moment I arrived for my appointment I was treated in a friendly and courteous way, and the receptionists went out of their way to make me comfortable. My eye tests were conducted in a thoroughly professional way and Mr. Valli explained to me the purpose and outcome of each of the tests. He explained his diagnosis to me in a clear and understandable way. I will continue to use Valli Opticians and am happy to recommend the service to others. “I have been a customer of one of the big High Street Opticians since I started wearing contact lenses 22 years ago and I have had 20 years of unwavering professional care. However, the last 2 years left something to be desired, as my eyesight deteriorated with my advancing years! Out of sheer frustration, I decided to have a consultation with you, as I was sure that I should be able to get better vision than I was experiencing with my prescription as it was at the time. My optician just kept telling me that I had to accept that I was getting older and that my contact lens prescription was the most suitable, even though I was unable to see clearly for either distance, or close work. The only alternative they offered was Varifocal specs, which I wasn’t happy about. During my consultation with you I was impressed by the detail of the eye examination, as well as by the time you took to find out about my lifestyle and my needs as a lens wearer. I was then amazed to hear about multi-focal contact lenses, which had never been suggested by my usual optician, even though they were aware of the difficulties I was having and despite actually being a supplier of this type of lens themselves. You offered me a trial of the lenses, which are the equivalent of Varifocal glasses, but in a contact lens. What can I say – I haven’t looked back! Although it took some time to get the prescription just right, you never once suggested that I ‘make do’, or ‘put up’ with anything less than the best option. You gave me several different lenses to trial, so that I could be sure of getting the best combination of distance and near vision and allowed me plenty of time to try the lenses so that I could see what suited my needs. For anyone wanting thorough, professional and friendly eye care I would have no hesitation in recommending the Valli Group of opticians and I wish you every success in the future. “Being very happy with my normal everyday glasses and the service of your staff I had no hesitation in asking you to provide me with some prescription sunglasses that were also a bit “trendy”. Sure enough, you got together a number of frames arranged for me to try them at your Meltham branch. The girls there are always very helpful and we settled with Porsche rather than Rayban or Oakley. They were fitted with the appropriate lenses in time for me to go to Marbella. It was a real pleasure to read all the menus and wine lists without screwing my eyes up – we ate every meal outside, wonderful. I have just one query; how do I avoid the panda eyes that came about as a result of wearing them all the time? I thank you and your staff once again for your wonderful service. “I’ve been going to Haighs Opticians for a long number of years and I have always found the staff friendly and helpful, it’s easy to park and I wouldn’t go anywhere else. “I just want to say that your Mytholmroyd branch is a friendly practice that treats you like a human being, not just a face in the crowd. “I have found Valli Opticians to be helpful, efficient and accurate in prescribing glasses. The service you give is second to none. “I have been a customer at your Opticians for over 30 years. I am continually satisfied with the service I receive from the Opticians and shop floor staff and always find the staff helpful, friendly and polite. I prefer to support local businesses in my area and find that I can always be guaranteed an excellent service with Valli Opticians. “I would like to thank Mr Valli and his Team at the Opticians in Lockwood. For me, the care and attention to duty is second to none. So if you want the best, Valli Opticians is the place! “I would like to thank you and your team for the care and attention shown to my daughter Joanna recently. We had finally agreed that she could have contact lenses and came to you for advice. You spent a lot of time assessing her prescription and recommending the right lenses for her. A special appointment was arranged where an extremely patient member of your staff showed Joanna how to put the lenses in and out. When the lenses arrived, you gave Joanna clear guidelines on how to look after them and regular appointments to make sure she was getting on ok. Excuse the pun, but she has never looked back! Thanks again for all your help and I will certainly be recommending you to my friends and contacts. “I am writing to thank you and your staff at Valli Opticians have been brilliant. I have just had my eyes tested and wanted to pass on my thanks to all your staff in Lockwood who attended to me and my daughter and previously my husband. I have worn glasses for over 20 years and wanted a change to contacts. The thorough examination, reassurance, help and patience in putting in and out the contacts I received from your Optician, Mr Ramsden, was excellent. The level of care and quality of treatment has been nothing short of outstanding. You should be very proud at having assembled such a team to work with you including your reception staff. I am most impressed with the attitude and professionalism of your team and the efficiency of service. I strongly feel that good service should be acknowledged and I have found my treatment a refreshing experience and I will continue to be a loyal customer. I will be sure to pass on to family, friends and colleagues the high customer care you provide. The Staff are kind and friendly. I have been seen promptly in cases of emergency. I consider that I have had good professional care. We are fortunate to have an Optician in the village.